Enjoy creature comforts, tropical gardens, a lovely beach, top quality facilities and a huge choice of activities whether staying alone, as a couple or family. Playa Langosta near Tamarindo, Guancaste. Cala Luna is open year round. 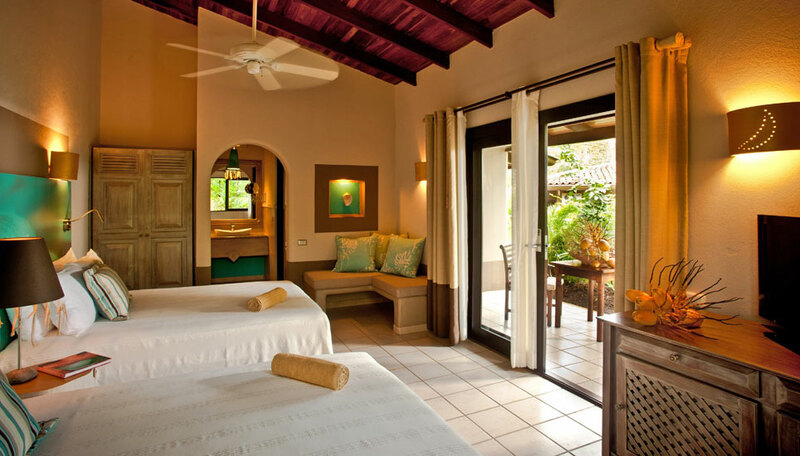 Cala Luna is a stylish hotel about a 15-minute walk from the centre of Tamarindo, in the Guanacaste region of the country. Tamarindo is a popular beach resort with great beaches and it’s known for good surfing too. The little town is a lively place full of bars and restaurants. If you want to be close to but not in the middle of Tamarindo, Cala Luna is a great choice. 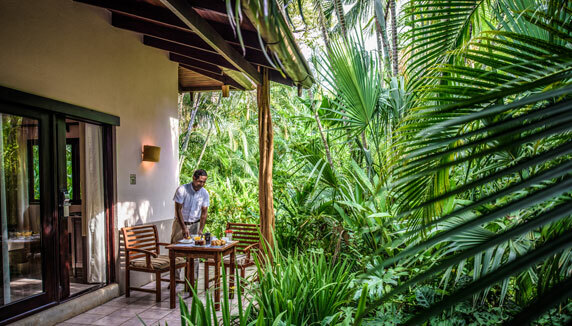 It is a 41-room boutique hotel in a lush, jungle-like setting, with an emphasis on wellness thank to its open-air spa treatments, free morning yoga in the yoga pavilion, and organic/sustainable cuisine – which, by the way, is very good, though not cheap. The focus of the hotel is the lovely swimming pool area which is surrounded by trees (often visited by cheeky monkeys!) and with the open restaurant at one end and the bar/lounge area at the other. 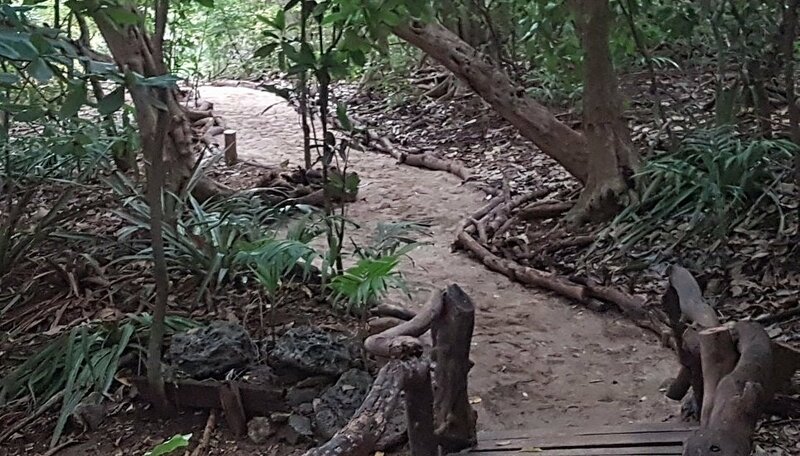 The hotel is not actually on the beach, but it’s just a short 2-minute walk through the property, over a tiny gravel service road at the back, then through a small patch of jungle. 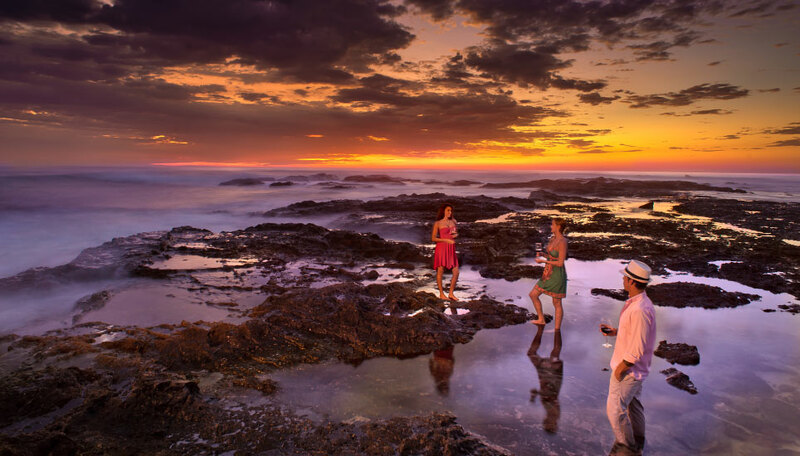 The beach you come to is often used for evening sundowner drinks, sitting enjoying the coast and the wonderful sunsets, and it’s a great rock-pooling area. However, due to the rocks, it’s not good for swimming from here, but there is a great swimming beach literally about a 2-3 minute further along the beach. The 20 deluxe rooms have all you would expect from a high quality hotel (including air-conditioning), and they are stylishly decorated. There are also private villas (1-, 2- and 3-bedrooms), some with private pools, which are great if you’d like more space or want the family or a group of friends together. Why go to Cala Luna? Accommodation, daily breakfast, morning yoga, car parking. 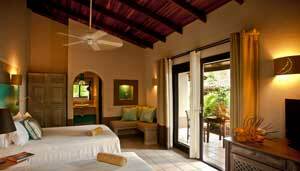 There are 41 rooms – deluxe rooms and luxury villas. Deluxe rooms have 1 king or 2 queen beds and accommodate up to 2 adults and 2 children or 3 adults and 1 child. They are air-conditioned, have fans, a flat screen TV, complimentary Wi-Fi, phone, safe, bathroom with a hairdryer, and a terrace looking out over the gardens. Interconnecting rooms are available. Villas provide spacious accommodation with a living area with flat screen TV, phone, safe and Wi-Fi, dining area, kitchen with microwave and fridge, and en-suite bathroom with a hairdryer. Each has a terrace with chairs and a private pool. 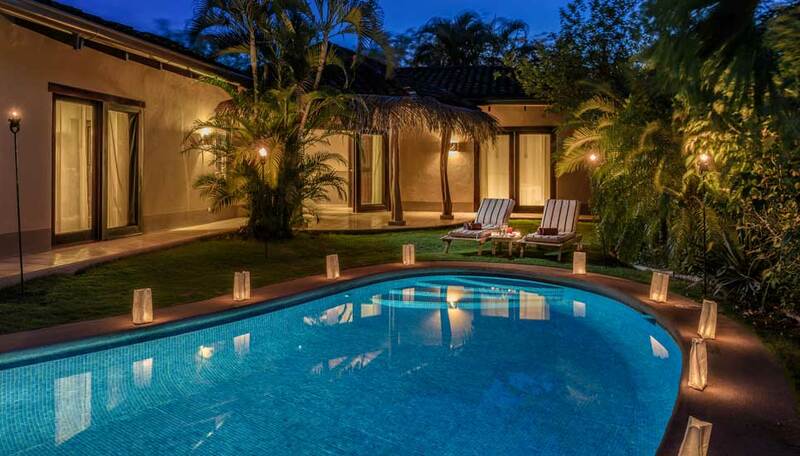 There are villas with 1, 2 or 3 bedrooms. Children of all ages are welcome. Villas make excellent family accommodation. Free Wi-fi in all rooms and social areas.